When I’m at home, I spend a lot of time in bed. It’s more comfortable than my wheelchair, and it’s good to get stretched out for at least part of the day. When I’m not in the wheelchair, the cat is. He loves the wheelchair. He’s determined to stay there for as long as he can. Somehow, the effort of getting the cat to move is more onerous than the transfer from bed to chair. And the cat doesn’t help. When he notices me starting to get up, he closes his eyes tighter, curls up a little more, and hopes that he’s just imagining it. I’m using a power chair in the house. My dog practically insists to be on my lap when I’m in my chair. She’d sit there all day if I let her, lol. When I’m not in my chair, she has no interest in it. 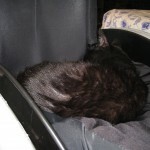 Our cat Slansky also thinks the wheelchair is his for the taking. Dennis has to tip the chair almost upside down to get him out.